I guess I haven’t been keeping up with the Jones’ but I was just told February 18, 2012 is National Drink Wine Day. What a great excuse to enjoy some vino. Open a bottle of your standard stuff or even a new find. The list of benefits for drinking wine is growing. A glass of wine a day has been shown to improve heart health, reduce forgetfulness, help you lose weight, boost your immunity, and help prevent bone loss. Yikes, it almost sounds like a magical cure for all things bad. 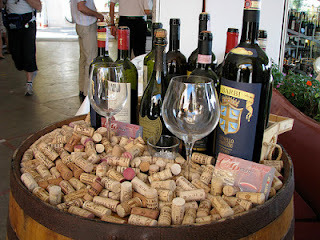 Wine has been made for thousands of years and the making of it has been refined over the years. European wine making dates back more than 6,000 years. There are over 20 million acres in the world dedicated to growing grapes for the sole purpose of making wine. To celebrate National Drink Wine Day, visit your local wineries, bars, restaurants and liquor stores. Why not create an excuse to host a wine tasting party? Either way, go enjoy some wine in whatever way you like. As my Italian mother would say, Cin-Cin!